Scientists have discovered a previously unknown property of spider silk, and used it to create a remarkable new “hybrid” material. The new bio-inspired thread, which acts like both a solid and a liquid, could lead to a host of new materials and technologies. Spider silk is one of the most extraordinary materials found in nature, featuring tensile strengths comparable to steel, and elasticity commensurate with rubber (at least on a weight-to-weight basis). Together, these two properties make it two to three times tougher that some of the strongest synthetic materials, including Kevlar and nylon. What’s more, spider silk is sticky (to catch unsuspecting prey), antimicrobial, hypoallergenic, and biodegradable. So scientists and engineers would like to understand as much about it as possible to develop similarly robust synthetic materials. New research conducted by scientists at the University of Oxford and the Université Pierre et Marie Curie, Paris, France, has uncovered yet another remarkable attribute. The capture silk produced by orb spiders (a common garden spider) is always taut, even after it has been stretched to many times its original length. What’s more, it contracts in a way that’s quite liquid-like. 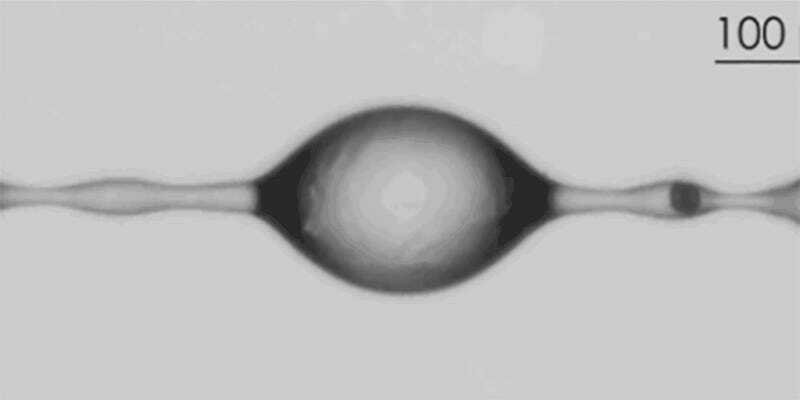 When spider silk is compressed, its filaments shorten by spooling inside tiny droplets of watery glue that cling to the threads, allowing the web to remain under tension. The process is reversible, allowing the thread to be extended. These findings now appear in the Proceedings of the National Academy of Sciences. Eventually, these hybrid threads could lead to advancements in materials science, engineering, and medicine.